I was watching a demonstration of an artist doing a pen and watercolor of a gorgeous building. Instead of using a waterproof pen for the initial drawing, she used one of these. Many people buy these and use them simply as pens. Not I, said the fly. These are water-soluble, making for beautiful effects once water is applied. In today’s post, I used the brown pen for my drawing and went back in with a bit of water. On the rose, I added a touch of red from my travel palette to the flower and a bit of green to the leaves. In the vase and flowers (sorry it’s crooked, I do all my art journal stuff on my lap in front of the TV), I added water only. And I actually love it with no other color at all. What do you think? 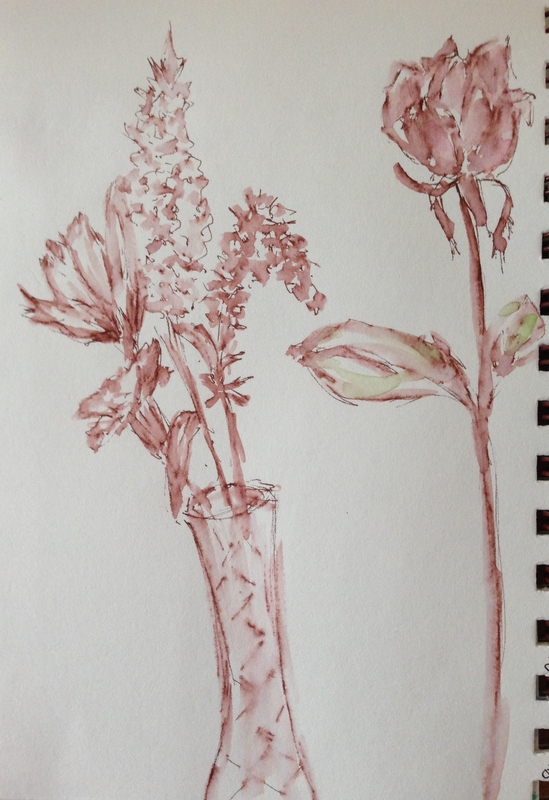 For the flowers in yesterday’s post, I drew them in pen, went back with water to blur the lines a bit – then once the ink dries, it is apparently set. Went back in with watercolor paint on top. The underdrawing didn’t move. Just gave a very cool effect to the flower as a whole. Just wanted to share this with all of you, since these pens are a steal at Blick and elsewhere. Maybe it’s just me – but I love the effect it gives! Peace and happy Tuesday to all of you. Enjoy! I created this mixed media painting in my art journal yesterday. I’m curious what thoughts or feelings it might evoke for you? I also couldn’t resist giving Strathmore another plug. 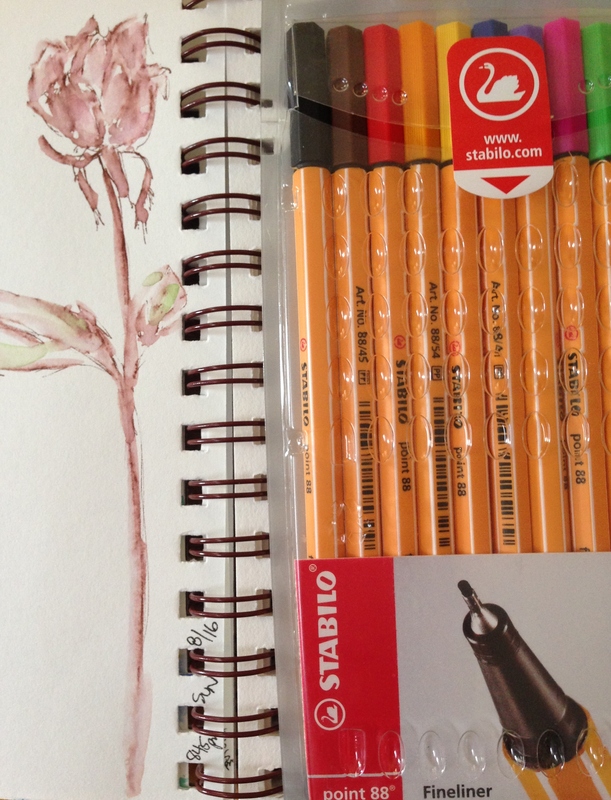 As some of you know, I absolutely love the Strathmore Visual art journal series. I’ve now filled my second one and started on my third, which really has me stoked! The Visual journals come in several flavors. I started with the Drawing product, then tried the Mixed Media, and now I’m hooked. So I ordered a couple more, in two sizes. Why? I’ll tell you. I can throw any medium at this paper: pen, watercolor, acrylics, colored pencil, graphite, Tombow markers, water soluble oil and wax pastels, even collage. No bleed-through. Is there rippling? Sometimes, but only a slight bit. I’ve worked with (140 lb.) watercolor paper that has buckled a lot more. 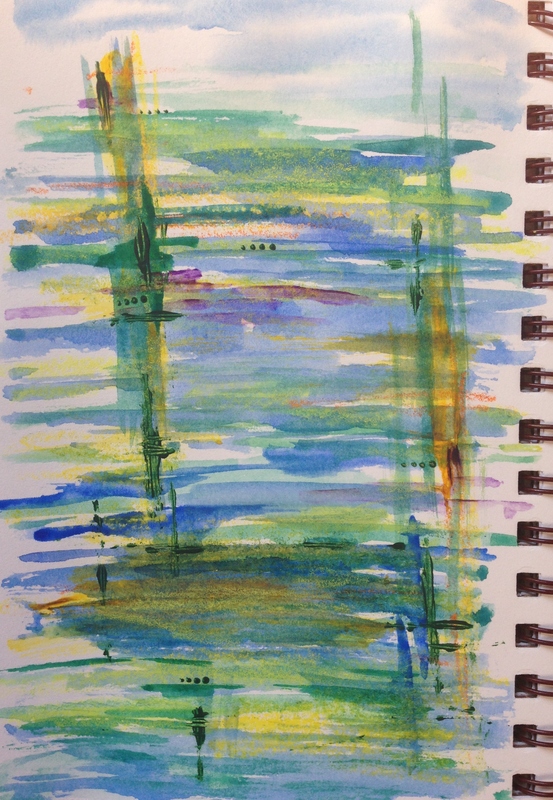 While working in this journal, it seemed to me that every medium I tried just loved the paper. It is smooth, with just a slight tooth. It reminds me of Stonehenge paper, which is much more expensive. And yet, these little journals (the 5.5 x 8″ size) start at just over $5. I definitely had to have more of this paper. So I called Blick, and talked to a product specialist (Blick-speak for artist). Long story short, the paper in the Mixed Media Visual Journal is their 500 Series paper. This is 100% cotton paper, their top of the line! It’s archival, acid free, and sized for wet media. It is a joy to touch and to work on. It turns out that I couldn’t even buy the paper and make the journal myself for less money. These journals are an amazing deal. I just had to let you all know! The painting was a journey. I needed some space to sort out my thoughts, and my little journal was the perfect way to do that. 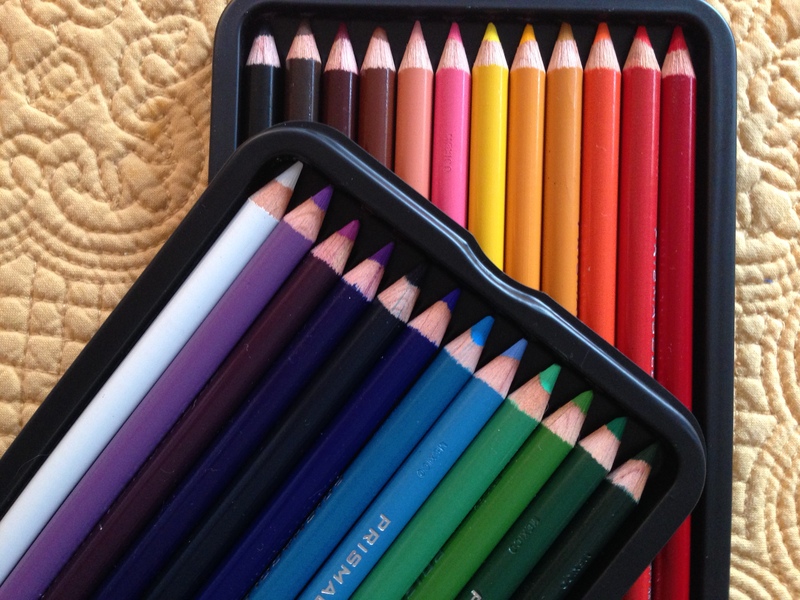 It includes watercolor and acrylic paint, as well as water-soluble oil and wax pastels. I really enjoyed marrying all these mediums together on this delightful paper. By the time I was finished, I felt like I’d been on a mini-vacation, refreshed and at peace. Just what I needed. And I wish the same for you this Sunday. 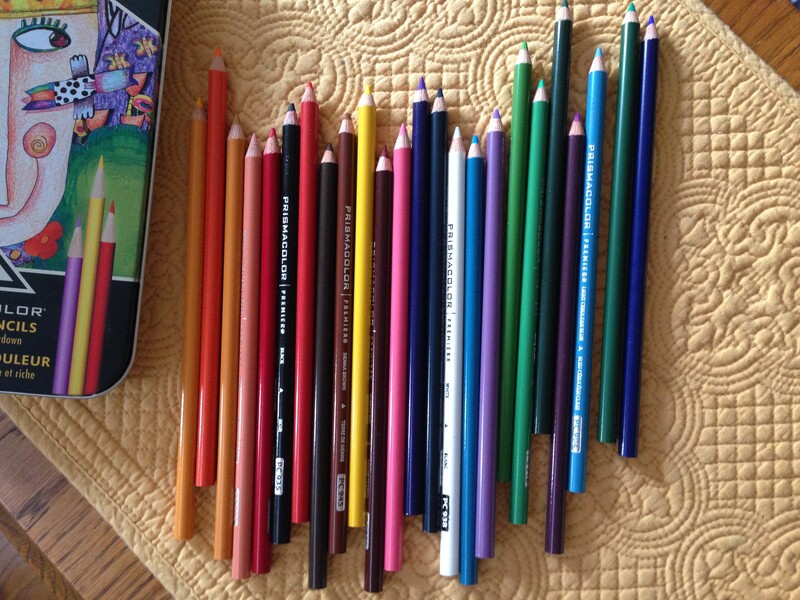 I bought my daughter, a talented artist in her own right, a bunch of art supplies for Christmas, including a set of 24 Prismacolor colored pencils. I was trying to think of supplies that she could take anywhere, that she could get lots of mileage from, and that wouldn’t take up lots of space. 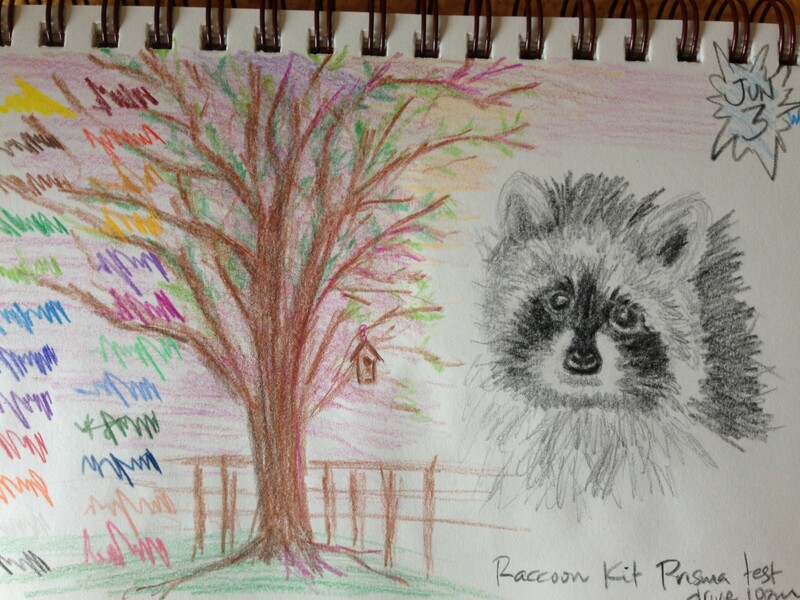 So after drawing the little raccoon kit, which was to be my subject for the letter K this alphabet cycle, I thought it might be fun to swatch out the rest of the Prismas to see what they could do. As advertised, they do have a good, smooth color laydown, and blend well. I still prefer the Polys because they are much less waxy and their barrels are a little bigger, making them more comfortable to work with for longer periods, but this is a great second set to have. It’s a nice color range, and I was pleasantly surprised by their quality, too. I enjoyed the colors so much, in fact, that I was inspired to sketch a little scene from memory. Trees are so cool. One day, I’ll be able to draw a convincing tree, but for an I-really-should-be-sleeping piece of work, I’m happy with this one. I hope you’re having a wonderful weekend, and that you get to experience a big dose of zen today. Peace and pointy pencils to you! Art is so much fun. I’m working toward eventually making art quilts (for fun and profit), and toward that end, I decided to cut out a piece of organic quilt batting, and try out a bunch of mediums on it to see how they fly with the fabric. I didn’t expect the finished product to be postable, but I’m actually quite happy with the result. So, here it is! 4) Portfolio water-soluble oil pastels in violet, yellow, and yellow-orange, taking up most of the lower R quadrant, except the very corner. This was the biggest, happiest surprise of all. The crayons themselves don’t look vibrant at all, but they really got jazzy and happy when I dipped them in water and drew right onto the fabric with them! 5) Bottom right is (I think, it was sitting around in a palette) cadmium yellow tube watercolor paint, which also translated very nicely to fabric, much better than I thought. I’ve never tried painting watercolor on fabric before. 6) Then, I went around the border with some gold Lumiere metallic acrylic, cut with water by about half. 7) Oops, almost forgot: I went over the Inktense pencil on the lower left with Lumiere lavender metallic acrylic. I took a picture of this in the sun, just so you could see the shimmer there, but it didn’t translate to the photo or screen that well. It’s a very cool, very slight shimmer in that whole bottom left-hand corner. In bright light, it looks awash with gold dust. But only in bright light! So it doesn’t leap out at you all the time. This, I like. I expected lots of stiffness. Nope. Soft, soft, soft! Almost gloriously soft. Probably the roughest sections are wherever there is metallic acrylic, but it sits on top of the batting, so the fabric itself isn’t at all stiff, and the top (just in those areas) feels like you’re touching someone with pretty dry skin. All in all, not bad! I expected the Inktense to be really bright and vibrant. I did use some water with them, probably more than maybe some would use. My batting wasn’t dripping wet at the end, but it was uniformly damp and needed time to dry. I’m sure if I’d have used less water, my color would’ve popped more, but maybe more than I’d have liked. Still, if that’s the look you’re going for, you can probably get that with the Inktense pencils, and the blocks are definitely stronger, and will make a major impact, if you want that. I’ve not tried wetting the batting to see how permanent the Inktense and pastels are. I believe acrylic paint is permanent on fabric, so I wouldn’t even need to test that. This is just supposed to be a test swatch, but I really like it, and so I’m not in any hurry to try and scrub it and risk messing it up. I’m thinking this will eventually be cut up and will wind up going into embellishments on the quilts. Also, not sure if regular watercolor paint will wash out of fabric once it dries? I assume it would, but maybe staining pigments wouldn’t fully wash out? Not sure. If I put something on the fabric and thought it was too bright, I just thinned it with water. This worked straight across the board with the exception of the water-soluble oil pastels. And I’m sure if I’d have really worked at those, I could’ve tamed those colors a bit. But I really loved them! They were my favorite part of the piece (and the biggest surprise, because I almost didn’t use them at all)! It may just be me, but every time I look at this, I see those gorgeous violet and yellow violas that come out at this time of year. I just love purple and yellow together, and those Portfolio pastels are so inexpensive that I think I’ll really be enjoying using this medium most when I want a really strong color statement. 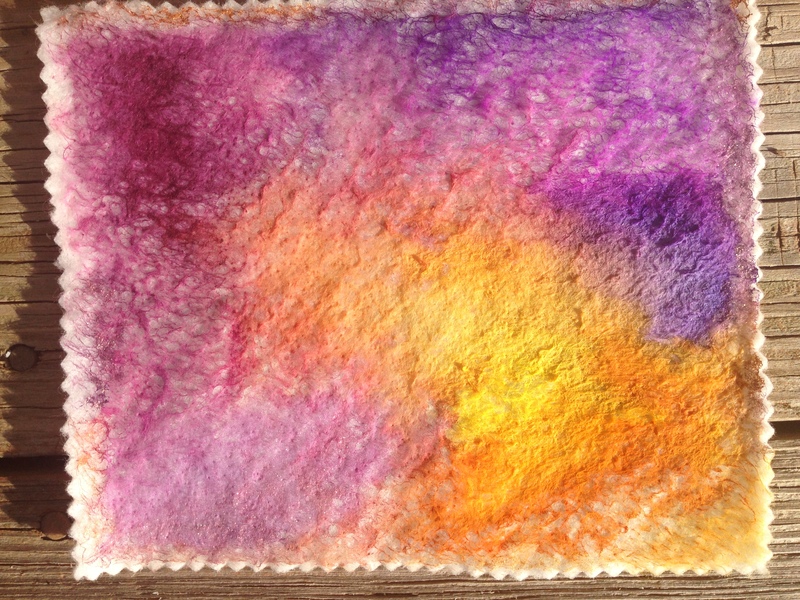 Tomorrow, I’ll be sharing another mixed media fabric experiment to celebrate spring! Playing with art supplies is so much fun! Sometimes the less you know, the better; the surprises never stop! Have a great Tuesday, and don’t forget to spread some joy around. Peace.